We stayed in New Zealand 3½ years working and touring and finally becoming citizens of this great South Pacific nation. With a small economy that depends too much on agricultural products, NZ is still a first rate country with all of the conveniences of the US or Europe, but not the choices - only 10 types of breakfast cereal instead of 40. Look at our New Zealand page to share some of our experiences. A year and a half was only enough to touch the surface of this marvelous and BIG country! We drove around the perimeter, staying south during their summer and north during the winter, and had great, sunny weather. The trip up through the center, or Outback was exceptional - thousands of square miles of sparsely covered red sand with huge flocks of colorful birds, kangaroos and wallabies. The occasional road-house provided hospitality along with diesel and cold drinks. After a year we were worn out, and back in Brisbane to sell our vehicle. A quick cruise though the Great Barrier Reef rounded out a marvelous 1½ years in Australia, the Land of Oz. 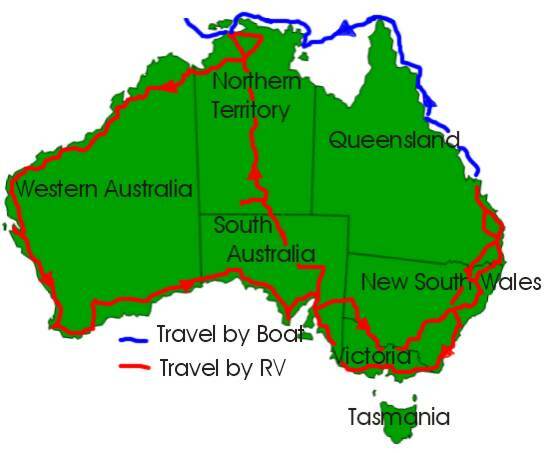 If you are intrigued, pick a spot on the Australia map or join us on our Australia page!